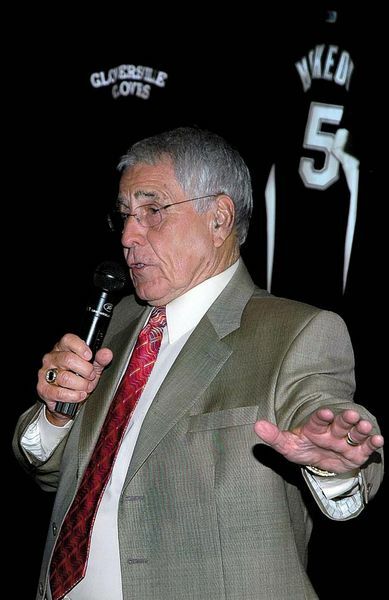 Jack McKeon speaks during the Fulton County Baseball and Sports Hall of Fame inductions at the Johnstown Moose Club on Saturday. With an eye on preserving and informing people of the area's rich sports history, the Fulton-Montgomery Sports Historical Society continues to build the framework for an ambitious project - a local hall of fame and permanent display at the Fulton County Museum. "We are currently working on a display at the Fulton County Museum and developing a timeline on the history of baseball in Fulton County," Mike Hauser said. "It will start back with the first game in Gloversville in 1886 and come up to present day with Derek Himpsl signing and playing in the minors for the Braves. That will be strictly baseball. We also are doing a history of Gloversville Little League this year so there is a baseball theme going on." Hauser, who is part of the Fulton-Montgomery Sports Historical Society, also will donate artifacts to the museum and hopes it will become a permanent display. Hauser also said the group has reached out to the National Baseball Hall of Fame for advice and guidance. "I actually came across a game ball that was affixed to a trophy from a game that was played here in 1902 with the JAGS, the Johnstown-Amsterdam team," Hauser said. "I found that at an estate in Pennsylvania. We are hoping it will stimulate people to come forward with items, even newspaper clippings we can make copies of to help record this area's rich sports history." The sports historical society is looking to recognize the achievements of local athletes whose abilities have allowed them to play professionally or be involved with professional sports at a national level or be part of a significant collegiate accomplishment. "I have been mentioning it when I run into people around town that I know are interested in sports and I think would be helpful to the cause and concept," Hauser said. "I have gotten a real positive feedback about it. The museum is excited because it will help further showcase Fulton County. The society is in the process of creating its first class for the Hall of Fame, which will recognize local athletes' accomplishments with a plaque that will be housed at the Fulton County Museum with a duplicate plaque awarded to the honoree. "The Hall of Fame Planning Committee is looking at anybody who worked or lived in Fulton County and went on to play professionally or people who came and honed their skills here in Fulton County," Hauser said. Some of the people being considered for the inaugural class are former Gloversville Glovers Jack McKeon, John Coakley and Robert Sise; world champion aerial skier Jumpin' Jack Johnston, Temple University and Philadelphia Eagles running back/linebacker Dave Smukler and professional racecar driver Dave Troutline. McKeon is expected to headline the first induction class May 5. The sports society also is in the planning stages of a project that will recognize the location of several places and events that took place in Fulton County. "We want to start putting historical sports markers around the area," Hauser said. "The first would be up on Route 30A where House of Pizza and Walmart are because that is where the Glovers played their home games," Hauser said. "Another would be on Harrison Street at Parkhurst Field, the Little League park, because professional baseball was played there from 1902 to 1907. Honus Wagner played on that field, the Pirates played there in 1902, the Red Sox came there in 1907 and in 1922 the Cincinnati Reds played there when Gloversville's George Burns brought the team here." Anybody in the area who is interested in sports history and willing to help with events or research is asked to contact Hauser at 725-5565 or by e-mail him at mhauser@frontiernet.net. GLOVERSVILLE - City resident and sports historian Mike Hauser has amassed a collection of baseball-related materials from people and organizations near and far since 1986. He has received them from former players and local residents, and takes a great deal of pride in his collection. But there will be no need to bug Hauser, asking him to see photos from the Gloversville Glovers 1942 squad or baseball gloves manufactured here in the early 20th century. All those hats, bats, balls and photos can be found throughout the summer and early fall right on Kingsboro Avenue. Hauser is the curator of an exhibit, titled "From Honus [Wagner] to [Derick] Himpsl: The History of Baseball in Fulton County," that made its debut at the Fulton County Museum last month. It is the featured exhibit at the museum this season. The exhibit, Hauser said, is intended to raise awareness of baseball's history here. The history is a long and storied one that stretches back to 1886, when the first organized baseball game was played in Gloversville. But it is also intended to raise the public's awareness of major league players from Fulton County who Hauser said legitimately deserve induction into the Baseball Hall of Fame in Cooperstown. He said players such as Dolgeville native Hal Schumacher, a pitcher in the 1930s for the New York Giants who once struck out baseball legends Joe DiMaggio, Lou Gehrig and Bill Dickey in the same inning in the 1936 World Series; and Gloversville native George Burns, an outfielder for the Giants who led the league in runs scored five times from 1911 to 1921, played well enough to receive the honor. Other potential candidates include Nelliston native "Bad" Bill Dahlen and Fort Plain's Bud Fowler, who Hauser said is the first black player to play on a white team did so for a squad in New Castle, Penn. in 1878, 69 years before Jackie Robinson broke the major league baseball color barrier in 1947. By putting together the exhibit, Hauser said he hopes to educate members of the media, who control the Hall of Fame voting, about the deserving players. He said he and others involved with the Fulton-Montgomery Sports Historical Society will be putting together information booklets and start contacting writers across the country. "It's a tough sell, because a lot of these guys played before the 1930s," Hauser said. The first Hall of Famers were inducted in 1936. Still, Hauser said he hopes their statistics speak for themselves. The exhibit also is a way to remember games of years past played in the area. A 1937 exhibition game between the major league Pittsburgh Pirates and the Gloversville Glovers, who acted as a minor league affiliate of the St. Louis Browns, included the participation of five future Hall of Fame members, including Honus Wagner, whose baseball card is worth more than any other. It was played on a site that is now home to the strip mall that now houses Wal-Mart and Hannaford. The Glovers beat the major league team, 11-8. "It was exciting because in a small town you never went to big league games, and you never get a chance to see big leaguers," said former Glovers player Jim Armstrong, who was a spectator at that game. Armstrong said his time with the Glovers feels like it was a long time ago-he made about $150 per month playing for the team. He took long bus trips, and was given about 75 cents for each meal. Now, he said he is pleased to see so much history around him, some of which he donated to the exhibit himself. "It's kind of amazing, really," he said. The Gloversville team eventually folded, a victim to television. People started watching games at home instead of having to go to see them, Hauser said, and in part because of that, the Glovers failed in 1951 and were no more. All that is left is the history and the memories all the way up to the present day-the exhibit documents Johnstown High School graduate Derick Himpsl, who plays in the Atlanta Braves' minor league system. "I think it's wonderful," said Museum President Joan Loveday. "I think it's a great exhibit and I think it'll bring in a quite a few people that will have an interest in baseball. I'm really surprised, myself, at the amount of people that went on to play [in the] minor and major leagues." 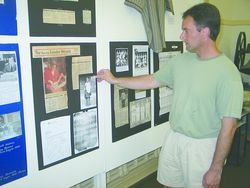 Hauser said he hopes to put together a similar exhibit on the history of football in the area someday soon. He said he has received plenty of memorabilia from people in the community, aside from Armstrong, and encouraged anyone with similar baseball artifacts or knowledge of old stories to come forward with them. The exhibit will be open this month Tuesday through Saturday from noon to 4 p.m., on those same days of the week in July and August from 10 a.m. to 4 p.m. and Tuesday through Saturday in September and October from noon to 4 p.m. Admission is free, though donations are appreciated. For more information, call Hauser at 725-5565 or visit www.tcsportspromotions.com. Zach Subar covers rural Fulton County news. He can be reached at ruralnews@leaderherald.com. 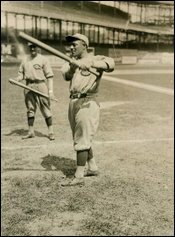 George Burns of Gloversville is shown during his time playing for the Reds in the 1920s. GLOVERSVILLE — When the name George Burns comes up, thoughts immediately turn to the famous actor and comedian who died in 1996 at the age of 100 —and not to the famous New York Giants outfielder who lived at 5 Orange St. in Gloversville. That George, arguably the original George Burns and the probable source of the name for the entertainer, retired to Gloversville and opened a pool hall at 16 South Main St.
From 1911 to 1921, ballplayer George Burns led the league five times in runs scored, appearing in 19 World Series games and setting a Giants stolen base record (383) that wasn’t broken until Willie Mays did it in 1972. At the same time, the actor/comedian George Burns was just a kid named Nathan Birnbaum, growing up in New York City and apparently paying attention to baseball. In later years he admitted the choice of his stage name was influenced by the two major leaguers of that era who owned it. There are, however, other versions of the story that say his brother came up with the name George and the surname came from a nearby coal company. But the case for Gloversville’s George is a strong one. The Giants’ George J. Burns, who turned left field at the Polo Grounds into “Burnsville” while he pioneered the use of sunglasses and stole home 27 times, was in all his glory in the entertainer’s hometown at the time when Birnbaum chose to be Burns. A second ballplayer, George H. Burns, was also playing in those days but in far-off Detroit and Boston. He did, however, finish his career with the Yankees in the late 1920s. Gloversville resident Michael Hauser is known in the area as a sports show promoter and memorabilia collector; he’s also a descendant of Gloversville’s Burns. Hauser has collected some important Burns artifacts — such as his glove and a bat —and is displaying them prominently now in the special local baseball exhibit he produced for the Fulton County Museum. Hauser tracked down the glove in Canada where it was in the possession of a collector. Burns, who was a minor leaguer in his hometown of Utica when the Giants bought his contract for $4,000, shares the exhibit with such other local major leaguers as Giants pitcher Hal “Prince Hal” Schumacher of Dolgeville, the Reds’ Chuck Harmon, Marlins’ World Series manager Jack McKeon, Boston catcher Russell “Bud”Holmes and Detroit pitcher Roger Weaver. Harmon and McKeon played minor league ball for the Glovers. Successful college players also have space at the exhibit along with minor leaguers Derick Himpsl, a pitcher in the Braves organization, and Mayfield slugger Randy Marshall, a Rangers farmhand. National League President Nicholas Young (1885-1902), whose family owned Fort Johnson, and Hall of Fame pitcher Jack Chesbro, who threw for the Johnstown minor league team in 1895 before moving up to the Highlanders (the precursor to the Yankees) and then the Yankees, will soon be added to the exhibit. Hauser has been making Burns into a personal project since 1989 when he traveled to Cooperstown to clear up his own doubts about the veracity of the stories he heard about Burns growing up. “I thought they were exaggerating,” he said of the family’s rendition of the legend. Burns may have been a top player but even after his huge contribution to the Giants’World Series victory in 1921, he was paid only $10,000, Hauser discovered. When the Giants traded Burns to Cincinnati before the 1922 season, Burns sought a raise to $12,500, the documents show. Hauser found a letter from the Giants to the Reds arguing against the higher salary and insisting the Giants would have offered no more than $10,000. When the Reds played the Giants in 1922, the Giants held George Burns Day and presented him with his World Series honors from the year before along with a diamond-studded watch. After three years in Cincinnati, which included a 1922 exhibition stop in Gloversville, Burns spent a final year with the Phillies and then retired. Though Burns returned as a Giants coach in the early 1930s, by 1937 city directories show he was running the pool hall and there are news accounts of him playing in local old-timers games. As seen in Hauser’s museum presentation, the New York Herald Tribune caught up with Burns in Gloversville in 1950. Alongside a photo of Burns in his prime with the Giants there is a shot of him at his desk at G. Levor leather company where he worked as a payroll clerk. He retired in 1957 and died in 1966. Hauser believes Burns should be in the Hall of Fame and has presented his case to the Hall’s research department. Hauser is not optimistic, although Burns continues to receive a few votes each year from the Veterans Committee. He compares Burns’ career — in stature for his era —to that of Bernie Williams, another top player who may not make the Hall. Burns has a lifetime batting average of .287, hit .300 or better three times, scored 1,188 runs including 115 in 1920, collected 2077 hits with 611 RBIs and finished 15 seasons with a .384 slugging percentage. He stole a league-leading 62 bases in 1914 and 40 in 1919. In the 1921 World Series against the Yankees, Babe Ruth’s first in pinstripes, Ruth’s home run to establish the lead was erased in the eighth inning by Burns’double. As Burns entered the more live-ball era of the 1920s, when power hitting was cherished, “his lack of power was a detriment,”Schechter said. It was also an era in which players were judged to be past their prime once they turned 30, a mark Burns hit in 1920, Schechter said, explaining why the Giants traded him after one of his most productive seasons. Meanwhile, Hauser said, those area sports enthusiasts who enjoy such debates are invited to join the Fulton-Montgomery Sports Historical Society. Contact Hauser at tcsportspromotions.com.